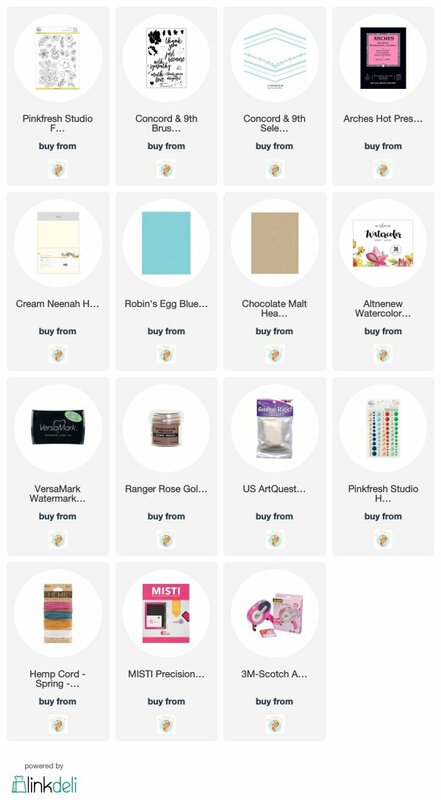 Before getting into the steps of how this card was made, here are the winners – YAY! A big hearty THANK YOU to all of you that played along. 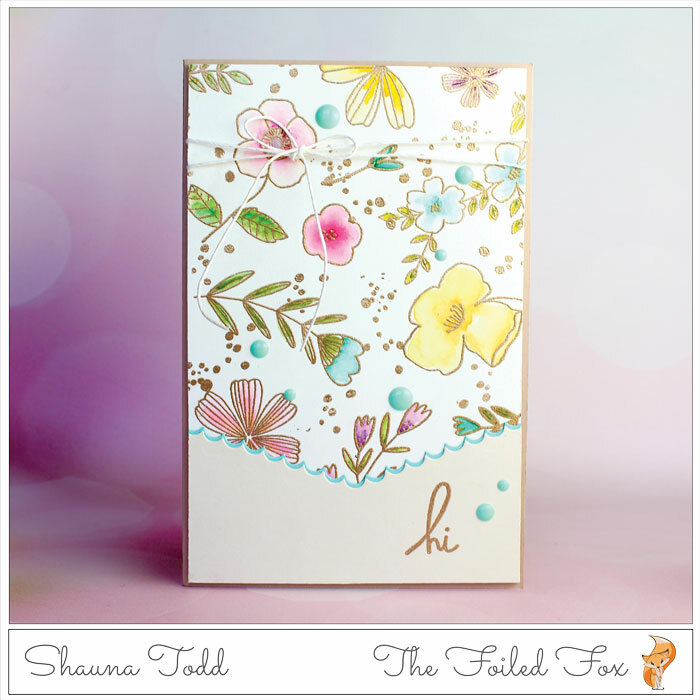 Heather and The Foiled Fox team loved reading all the comments and getting to know you just a little bit. We will have another giveaway in the near future, we hope you will join us again! 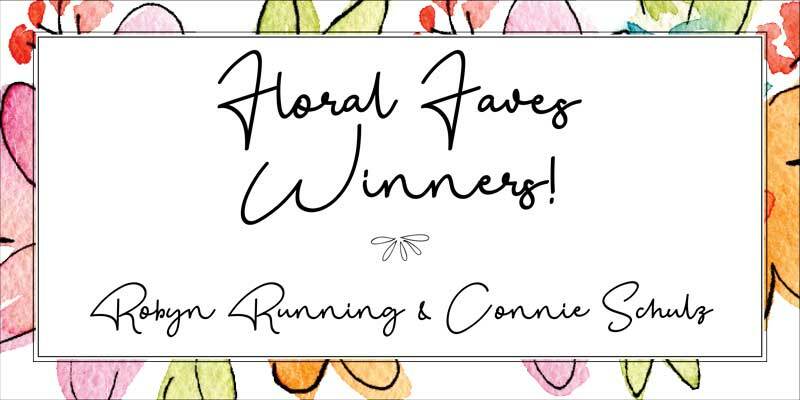 For Robyn and Connie, congrats! Please check your email for the details on how to use your $25 gift certificate. 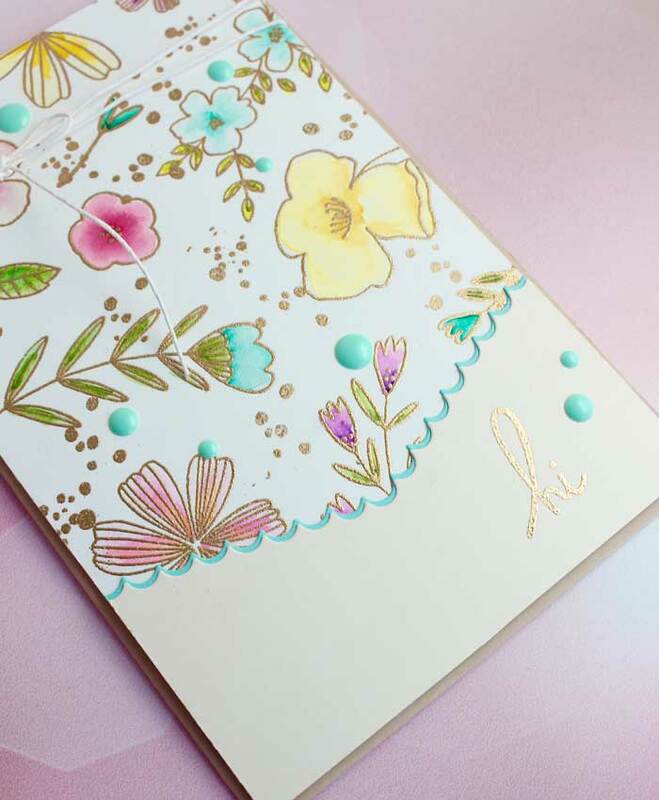 This card starts with the Pinkfresh Fleur 1 stamp set and a piece of hot pressed watercolor paper. With the help of a stamp positioner like a MISTI, I arranged many (most ) of the flower stamps from the Fleur set onto the watercolor paper panel that I had already placed in my MISTI. After the arrangement of the flowers was to my liking, I closed the door of the MISTI so all the stamps would adhere to the door. I prepped the paper with anti-static powder and then stamped all the flowers with Versamark ink. 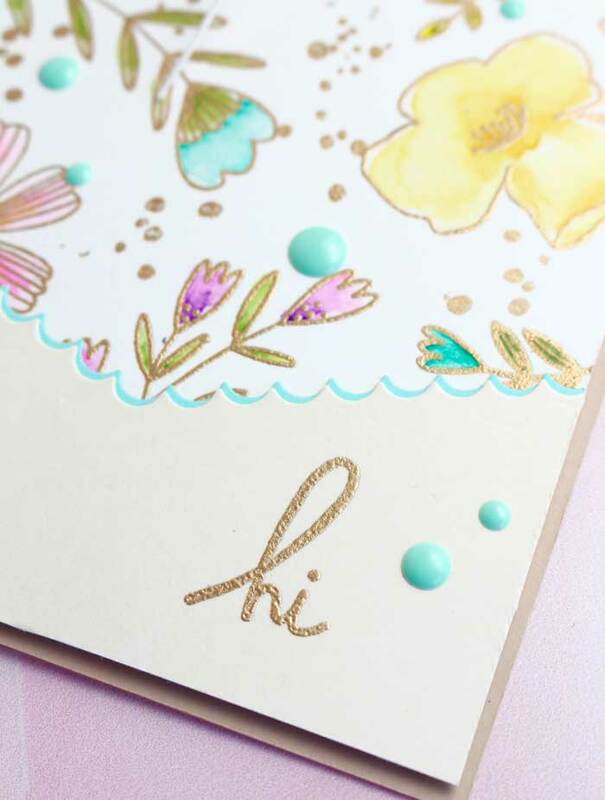 After stamping it a couple of times to ensure a good impression, I added a few ‘intentional’ splatters in the spaces between the flowers by using a splatter stamp from the Concord & 9th Brushed Blossoms stamp set. As you have probably heard from me before, I LOVE these stamps. They give a wonderful sprinkling of random-looking dots. After everything was stamped, I was ready to sprinkle Rose Gold embossing powder by Ranger over the whole panel and heat embossed. I was going for a soft Spring look so I was careful to choose more pastel watercolor colors. The watercolors I used were the Altenew watercolor palette. I use this palette a lot. 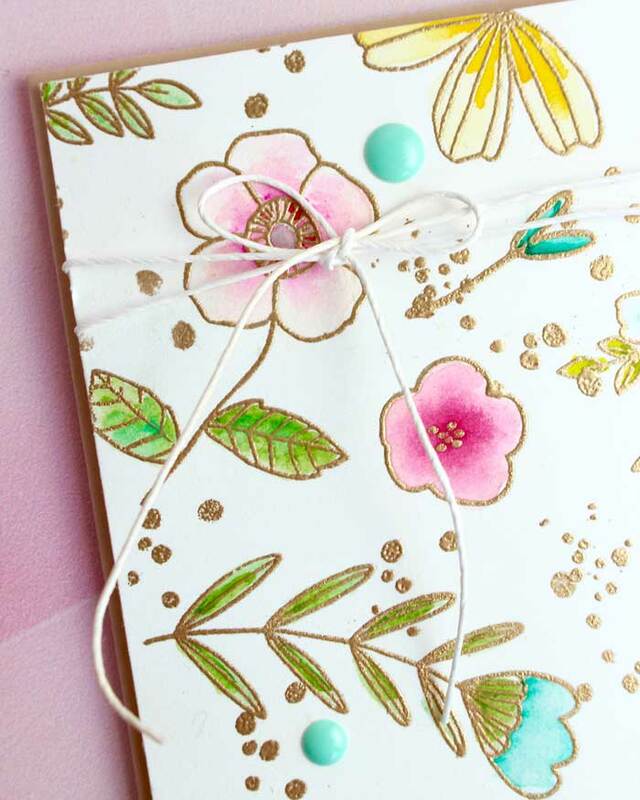 I love the beautiful array of colors, but, of course, you can use any watercolors you have on hand! While the panel was drying, I cut one edge of two short pieces of paper, one cream card stock and the other Robin’s Egg card stock, with the scalloped die from the Concord & 9th Select-A-Size die set. I then stacked one piece over the other, letting the Robin’s Egg card stock peek out over the top of the cream paper and then adhered it to the bottom of the watercolor panel. The whole panel was then trimmed down to be a long slender size. The card is ready for the sentiment. I chose a simple “HI” sentiment but really any will do! The HI was first stamped Versamark ink and then heat embossed with Rose Gold embossing powder. The card is nearly finished, I tied a bit of off-white twine at the top and then adhered it to a Chocolate Malt card stock card base. A few Robin’s Egg enamel dots were added and VIOLA! It was ready to go! Thanks for joining me today. I hope you enjoyed the project and again, a big congrats to Connie and Robyn!! So very pretty Shauna. I like the way you left a peek of the Robin’s Egg Blue paper with the scalloped edge under the Chocolate Malt paper. Great way to add dimension & interest. 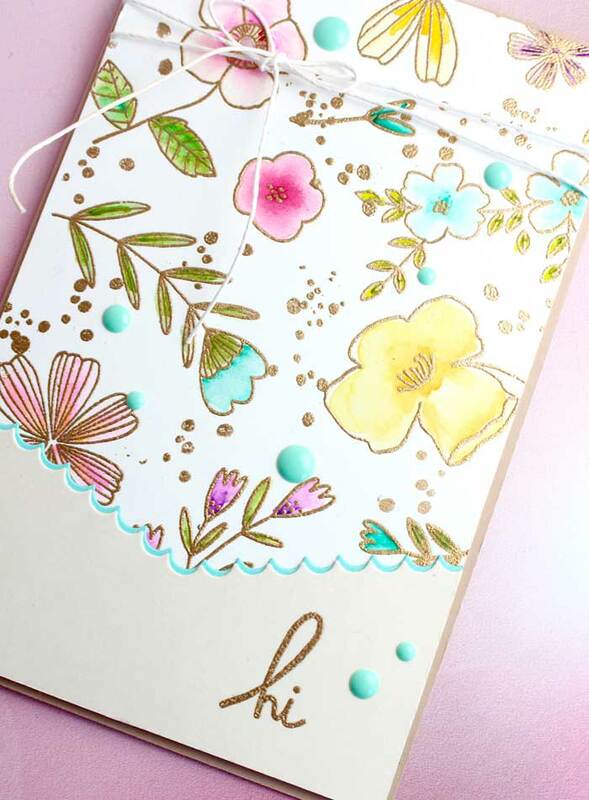 This card makes me feel like the promise of spring is just around the corner.